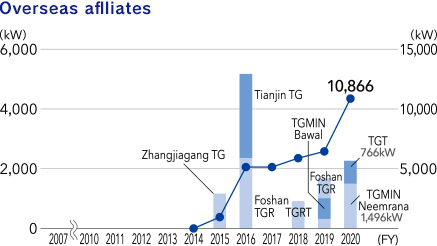 Building Low-Carbon Societies | Toyoda Gosei Co., Ltd. In addition to lighter weight products that lead to improved vehicle fuel efficiency, we are reducing CO2 emissions through improved productivity and more efficient distribution. Keeping the rise in global temperature to below 2°C, as concluded in the Paris Agreement, is crucial and we must achieve greenhouse gas emissions of essentially zero by the end of the century. Minimizing CO2 emissions is one of the targets in our TG 2050 Environmental Challenge, and to achieve this we will take advantage of new production techniques and product development with a view toward next-generation vehicles in addition to our accumulated manufacturing strengths. 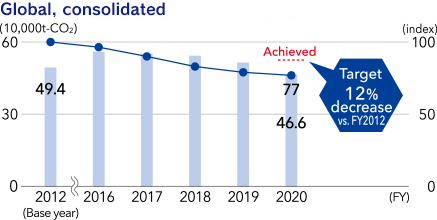 An execution plan has been incorporated in our 6th Environmental Action Plan with activity targets for FY2020. We are now formulating targets and scenarios for FY2030. We are also increasing distribution efficiency and undertaking other efforts to reduce CO2 emissions over the entire product lifecycle. 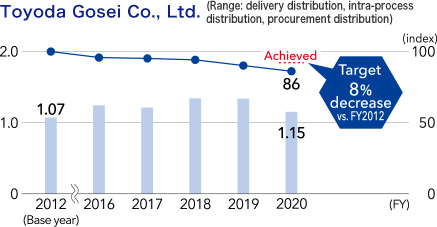 The Toyoda Gosei Group is reducing CO2 emissions in the product stage, production stage, and over the entire lifecycle to achieve the targets set in its 6th Environmental Action Plan. In the product stage, we are making headway in providing parts for environmentally-friendly, next-generation vehicles and developing products with lighter weight for greater fuel efficiency and lower energy consumption across the areas of materials technology, product design, and production technology. Examples include switching materials (e.g., from metal or rubber to plastic) in instrument panel peripherals and other interior products as well as in functional parts such as hoses, reducing the number of components, integrating functions, and using thinner material while ensuring strength. 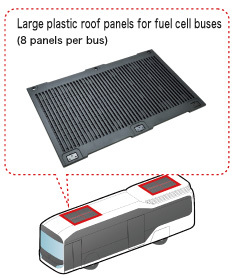 We have succeeded in switching from metal to plastic for lighter weight in the large roof panels placed over fuel cell stacks and high pressure hydrogen tanks. It used to be that metal had superior strength, but we have developed plastic material that contributes to lighter weight with reduced thickness while maintaining impact and heat resistance levels. We have also been able to reduce the weight of large parts with no loss of function, by using technology that forms the products with uniform thickness and high accuracy. We intend to expand this to similar products in the future. In the production stage, we are developing new production techniques that minimize energy usage and introducing energy-saving equipment through the Production Engineering Technology Environment Subcommittee started in FY2016. We also conduct regular kaizen to thoroughly eliminate waste. In FY2017, the TG ESCO (expert team that conducts reduction activities with genchi-genbutsu) formed in FY2016 implemented on-site kaizen activities that include the latest technologies and collecting and applying information on best practices from other companies. 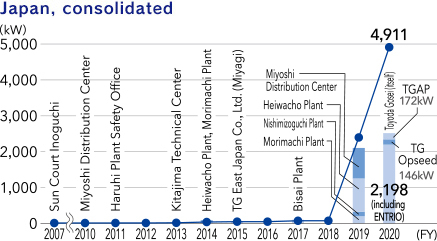 We have reduced CO2 emissions by installing liquefied natural gas (LNG) facilities at our Morimachi Plant and switching to LNG from heavy oil as boiler fuel and from the liquefied petroleum gas (LPG) used in production line furnaces. The steam used in production processes was previously generated by boilers using heavy oil, and this switch to LNG in particular has not only greatly reduced CO2 emissions but also led to reductions in sulfur oxides (SOx) and nitrogen oxides (NOx), both of which are environmental pollutants. The CO2 conversion factors used for Japan*2 are the 1990 Keidanren factors. The CO2 conversion factors used for other countries are from the GHG Protocol (2001). Toyoda Gosei has prepared and distributed green procurement guidelines for materials and parts procurement with low environmental impact. Together with regular supplier surveys to ensure compliance, we also provide support when improvements are needed. We are also making aggressive efforts to reduce CO2 emissions throughout the lifecycle, including efforts to increase distribution efficiency with truck allocation that aims to raise truck loading efficiency and shorten distribution lines, and review of transport methods. Currently, Toyoda Gosei Co., Ltd. is moving to direct deliveries of products from our plants without going through a distribution center. Transport loss is being decreased with the cooperation of customers whose delivery volumes will increase with the startup of new products, who allow us to make direct deliveries from the start. With input from our Quality Control Division, we are also investigating the optimum numbers of products for which the maximum quantity per reusable container can be increased. The result has been a decrease in the overall number of reusable containers and a reduction in the number of truck deliveries, which also decreases distribution CO2 volumes. 1. Decreasing the number of allocated truck deliveries by improving transport and loading efficiency. 2. Shortening distribution lines by changing routes and producing products close to customers. We are moving toward a target of using renewable energy equivalent to 2% of our total global electricity consumption by FY2020. This includes purchasing clean energy in the forms of solar, wind, and green power. Our next challenge is to raise clean energy levels to at least 20% globally by FY2030. 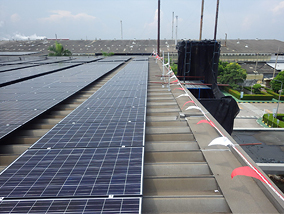 We have installed a solar power generation system in Building 5 at our Bisai Plant. The generation capacity is 110 kW. This is equivalent to 1% of purchased electrical power at the Bisai Plant, which will have the effect of reducing CO2 by 42t per year. 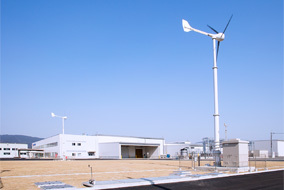 The Inabe Plant has installed a wind power generation system (10 kW) and geothermal air conditioning system. We are also planning to install solar power generation and other equipment. Of the six greenhouse gases, Toyoda Gosei Co., Ltd. uses three (HFC, PFC, SF6) and is conducting activities to reduce all of them. By FY2015 we had completed a switch to alternative gases with a low environmental impact for the shield gas used in the production of steering wheel cores and other gases. This has resulted in an 81% decrease in greenhouse gases since FY2012. We will continue these reduction activities in the future. 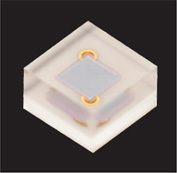 Toyoda Gosei is making progress in improving the quality of light, from light that is merely visible to light that brings out the charm of things, with the development of sunlight LEDs that approach a color tone close to that of sunlight and other developments to show objects including human skin and commercial products at their most natural and appealing. 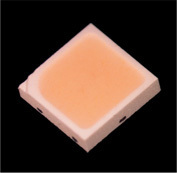 To make our attractive LED technology and products more widely known, we participate in domestic and international exhibitions and events and are working to encourage the spread of LEDs. 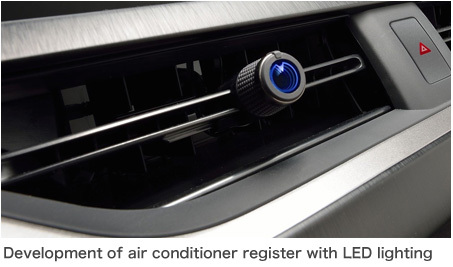 We have developed an air conditioner register with LED lighting incorporated into the knob that adjusts the direction and strength of air flow. This improves the nighttime visibility of the knob. Wireless power transfer technology*4 is also applied to avoid previous concerns such as wire harness breakage from repeated manipulations of the knob. Together with improved nighttime manipulability, the LED register also contributes to a futuristic and elegant interior mood, while use of an LED light source helps to reduce energy consumption. *4 Using the physical phenomenon of resonance, in which a vibrating system drives another system to oscillate at specific frequencies, the technology enables the transfer of electric power to a distant location by causing resonance in the frequency of the magnetic fields among resonant circuits.